A highly original, stirring book on Mahatma Gandhi that deepens our sense of his achievements and disappointmentshis success in seizing Indias imagination and shaping its independence struggle as a mass movement, his recognition late in life that few of his followers paid more than lip service to his ambitious goals of social justice for the countrys minorities, outcasts, and rural poor. 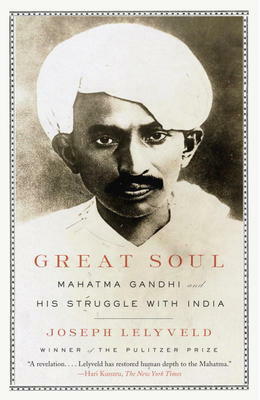 Pulitzer Prizewinner Joseph Lelyveld shows in vivid, unmatched detail how Gandhis sense of mission, social values, and philosophy of nonviolent resistance were shaped on another subcontinentduring two decades in South Africaand then tested by an India that quickly learned to revere him as a Mahatma, or Great Soul, while following him only a small part of the way to the social transformation he envisioned. The man himself emerges as one of historys most remarkable self-creations, a prosperous lawyer who became an ascetic in a loincloth wholly dedicated to political and social action. Lelyveld leads us step-by-step through the heroicand tragiclast months of this selfless leaders long campaign when his nonviolent efforts culminated in the partition of India, the creation of Pakistan, and a bloodbath of ethnic cleansing that ended only with his own assassination. India and its politicians were ready to place Gandhi on a pedestal as Father of the Nation but were less inclined to embrace his teachings. Muslim support, crucial in his rise to leadership, soon waned, and the oppressed untouchablesfor whom Gandhi spoke to Hindus as a wholeproduced their own leaders. Here is a vital, brilliant reconsideration of Gandhis extraordinary struggles on two continents, of his fierce but, finally, unfulfilled hopes, and of his ever-evolving legacy, which more than six decades after his death still ensures his place as Indias social conscienceand not just Indias.